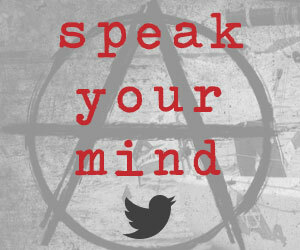 You are hearing from me mostly to explain why you aren’t hearing from me. Considering my age, you might reasonably wonder if I were dead. I’m in Evanston, but winter ends for me on Tuesday, January 9, when I fly back to GANNET who is in Marathon, Florida. This is to let you know that my plans have changed for this year. To back up briefly, I had the little boat hauled from the water and stored ashore at Marathon Boat Yard less than two weeks before Hurricane Irma hit. Despite being only twenty miles from where the eye made landfall, GANNET and most of the boats in the yard were not damaged. 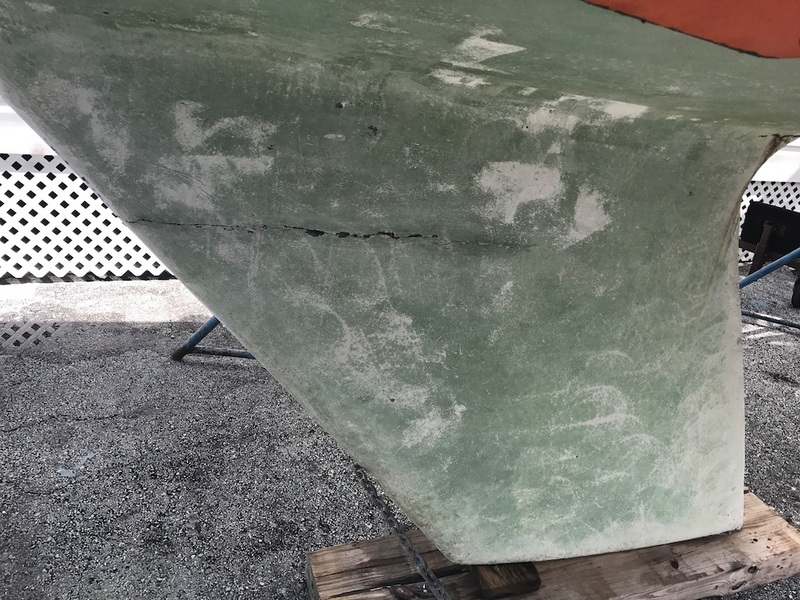 However, when she came from the water serious cracks were visible at the hull/keel joint. As another sailor observed they may be proof that I have been sailing her to the edge. The cracks in no way reflect on the design and build of Moore 24s. That their construction is outstanding is established by a small ultra-light boat conceived as a Wednesday night round the buoys racer now having completed 24,000 miles and crossed three oceans while experiencing several gales, two with 55+ knot winds as officially recorded by met offices ashore. 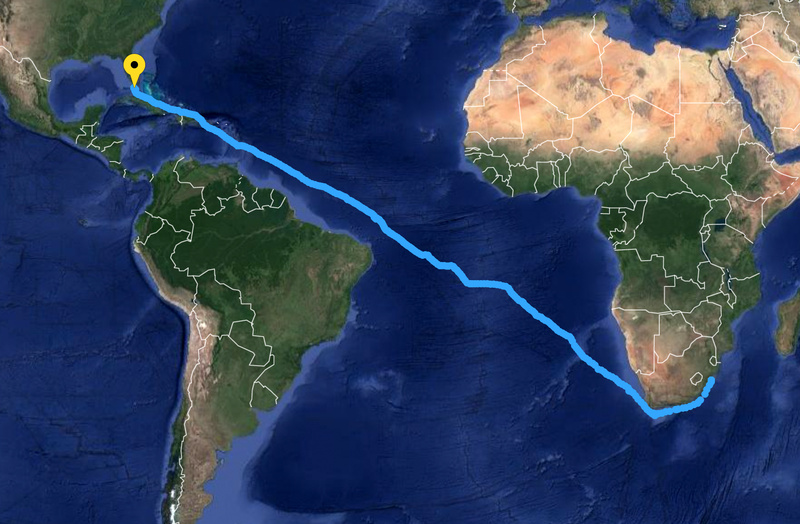 Although it was not an intended goal, since leaving Darwin, Australia, GANNET sailed 211º of longitude–Darwin is 131ºE, Marathon 80ºW–almost two thirds of the way around the world, with only three stops. The cracks have now been repaired and GANNET is due to be in the water when I arrive Tuesday evening. However, I have decided to defer sailing for Panama and San Diego until 2019. Sailing small boats alone across oceans is not all that difficult, but it does require focus and attention to detail, and I am distracted. Carol and I are buying a waterfront condo on South Carolina’s Hilton Head Island and the process has been excruciatingly drawn out. The condo is on part of the Intracoastal Waterway called Skull Creek, and the Skull Creek Marina, where I can base GANNET with easy ocean access, is right outside our balcony. Hilton Head Island is not my first choice for what is likely my last land home. New Zealand’s Bay of Islands is, but Immigration rules prohibit me my living there permanently. San Diego’s Mission Beach is second, but property prices have become exorbitant. Hilton Head is too hot in the summer, has the occasional alligator walk across a golf course, and is subject to hurricanes, but it has serene beauty and many virtues, among them that I might integrate my wife and my boat. So later this month I will sail from Marathon to the Skull Creek Marina, where I have signed an annual contract for a slip, and initiate the extensive renovations we plan for the condo. I have agreed to speak at the Chesapeake Maritime Museum’s Small Boat Festival at St. Michaels, Maryland, in early October, and weather permitting may sail GANNET up there and back. While it makes no economic sense to sail from Hilton Head to San Diego via Panama and then spend thousands to truck her back across the country, that is the plan. The annual contract for the Skull Creek Marina slip will end around February 1, 2019, consistent with a January departure for Panama. There are those who will say that I am through. They may be right. I am seventy-six years old. I should have been through long, long ago. Everyone else is. But I am not everyone else and I am not yet used up. I have more to do, and it is my firm intention to complete this circumnavigation, time and chance permitting. You may recall that there were those who said before I left San Diego that I would quit when I reached Hawaii. That was 22,000 miles ago. Some before and after photos of the keel cracks/repair are attached as well as a screen shot of GANNET’s track in 2017.